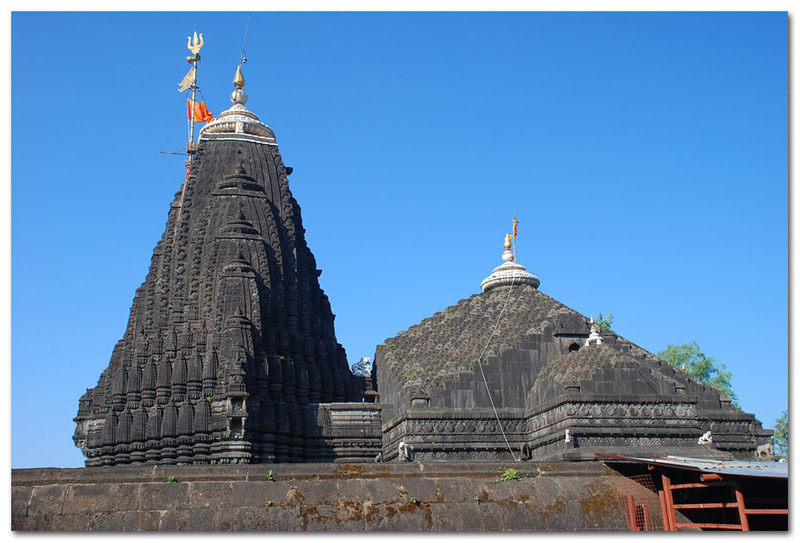 Trimbakeshwar Temple is one of the holiest and sacred place for Hindu pilgrims and is revered as a one of the 12 jyotirlinga shrins of Lord Shiva in India. The temple lies in the foothill of mountain Bhramagiri which is the origin of river Ganga (called here by name Godavari). 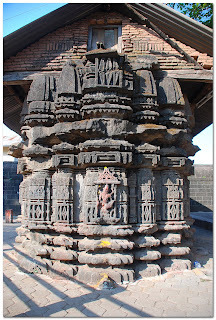 The most attractive part of this temple is presence of 3 linga's each representing Brahma, Vishnu and Shiva. All three resides in a hallow space within the Shivalingam, due to the hollowness these are not visible while you pray but through the tilted mirror which is mounted on the backside wall of the Shiva linga. This is the only temple where Shivalingam is not appearing over the ground but under. It's being said that these 3 linga's are eroding due to excess offering of water (Ganga) during puja's. Stories abound related to this temple and its name. I didn't get any concrete answers to why there are three linga's in this temple and thus so not mentioning here. This was my second day of my Shirdi Nasik trip, yesterday after halt at Shirdi, today I headed for Nasik, Gov buses frequently routes to Nasik and usually charge Rs 80 (you have plenty of private private Qualis riders with the same price) Shirdi to Nasik is a two hour journey and is around 80-90km for Trimbakeshwar the buses are available from Nasik CBS (central bus service). Frequency is around every hour or so, 30km away from CBS, charges Rs 20 for one side. After reaching Nasik CBS I took Trimbakeshwar bus and reached the place in 45 min. The place is full of of shops, hotels and small residents. 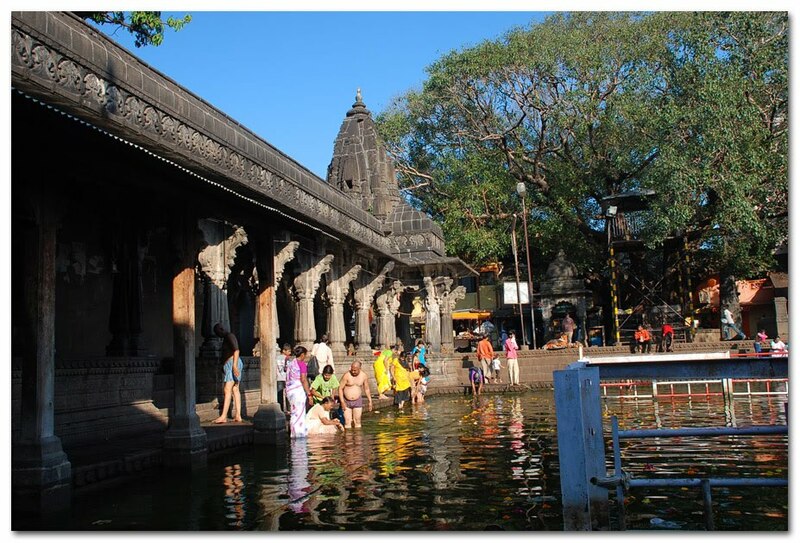 Being one of the highly sacred place, its hard to get lodges so easily and one has to plan much earlier, though Nasik being only 2 hour drive away one can opt for Nasik as well. 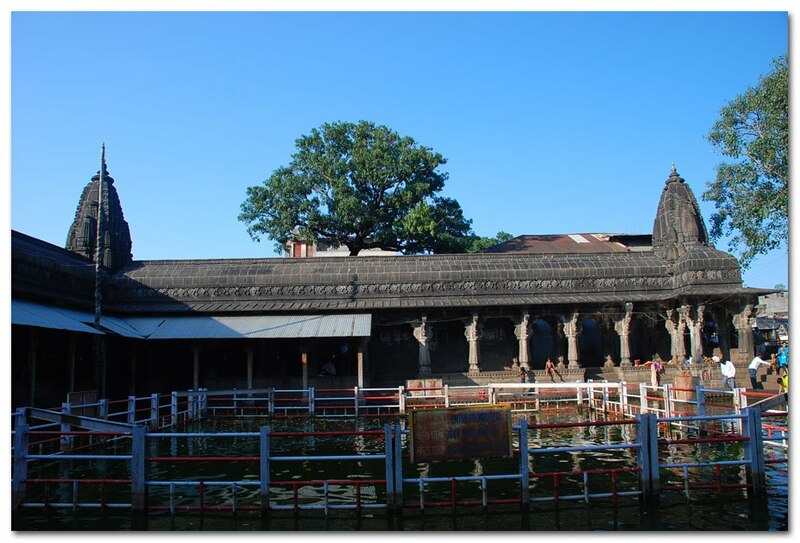 This temple is built by Shri Nana Saheb Peshawa in 1755-1786 AD took almost 36 years to complete it. Its is built with black stone and the Shivlingam is said to be emerged naturally. The temple is bordered with around 20-25 stone feet wall in height. Photography not allowed, you can't carry camera inside but mobile. Just in front of the temple main entrance we have two camera/mobile lockers (basically its just a shop who keeps your times). I put my camera in one of the shop paid Rs 10. 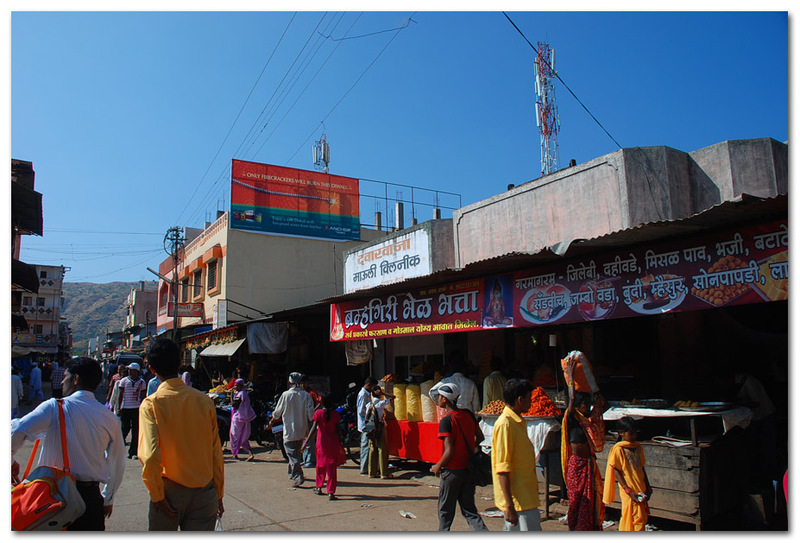 Besides the main gate is the shoe stand (Rs 1 per pair). Temple is just 10 min walk from the bus stand and thus no need for auto's. Entrance gate will lead you to the queue which has logical separation of around 6-7 lines. The queue to the main temple passes through Nandi temple which is built in front of the Shiva temple, Nandi facing Shivlingam (as you know Shiva temple always has Nandi Idol where Nandi always faces Shivalingam with an exception of Kapileshwar Temple in Panchavati where Nandi is not present at its place). Nandi Idol is siting on a platform which is a foot or two in height and is carved out of white marble. Crossing this Nandi temple you step in to the Shiva temple. You enter a big hall whose roof is in dome shape from inside. The sanctum is not big and houses the main Shivlingam and three lings residing in hollow structure. We were able to see all three miniature lingam only through the mirror which I mentioned earlier. 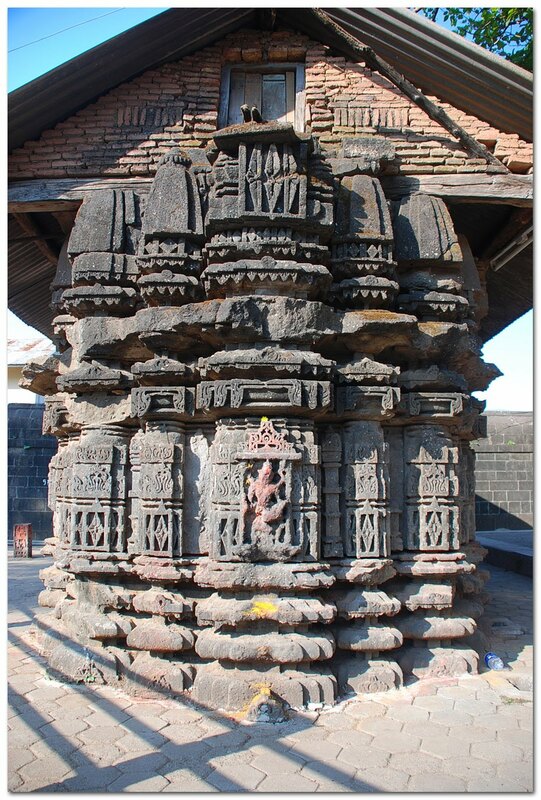 On the left side of this temple along the outer bordered wall, there are series of compartment built in continuation each having a miniature Shivlingam. There are around 32 such compartments out of which only four had Shivling. In all of them the Nandi Idol is damaged and none of the 32 strcuture is in the complete shape. Though the whole temple is built out of black stone but the roof top of sanctum sanatorium is made out of white marble as you can see in the first pick. Outside the temple just in-front of entrance gate, one can see few cows self feeding the grass, there must be some story behind this which I didn't bothered to find out. 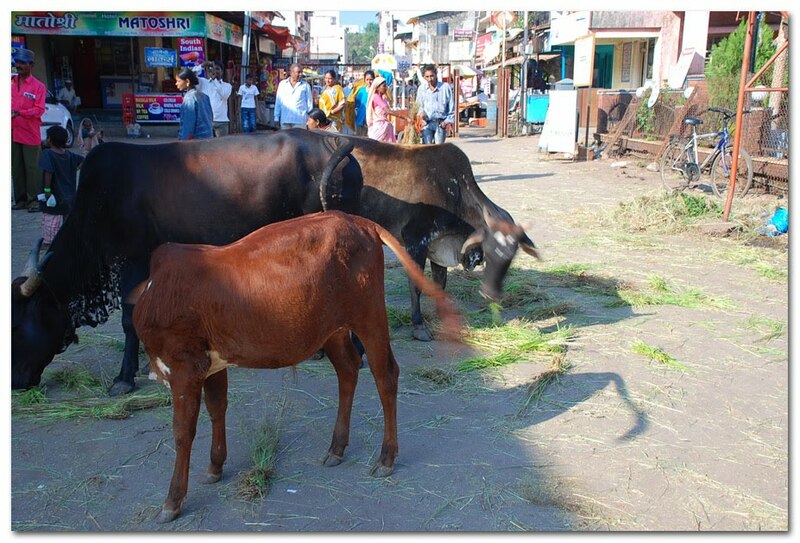 People were supposed to purchase the fodder and need to feed these cows. Just a 5 min walk away is a sacred pond called "Kushavarta" which is from where river Ganga takes here route to the rest of India. As per Hindu mythology one gets rid off of all its sin's if he he takes bath here. Story has that, Sage Gautam forced river Ganga to stall within the enchanted grass area he made and puts a vow on her. This he done so to take a holy bath in this water and to get rid of his sin for killing a cow. Sheemant Rao Sahib Parnekar built the temple around the stalled water at this place which we are seeing today. The walls inside all along the hall is inscribed by various Idols, and in all corners are some small temple. The most important fact of this pond is that it is the starting point of Kumb Mela which happens once in a 12 year and next is on 2015. Saints all over the world come to this place on the occasion of mela to take a holy bath. There are certain time allotted by the government abiding which Saints needs to take bath. They take bath in the sequence of their seniority and once they are done then rest of normal peoples can proceed. As per the rule the sadhus (Saint) belonging to "Vaishnav" sect will take bath in Godavari at Ram Kund, Panchavati and those belonging to "Shaiva" sect will take bath here. 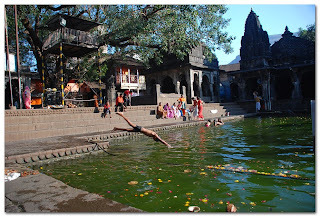 Since Godavari (Ganga) flows from here and reaches at Ram Kund so both are considered pious. This rule was set by Peshawa during the time where in one of the Kumb mela these two groups fought with each other over who would take the holy bath first which resulted in hundreds of death. Another attraction of this place is the Bhramagiri Hill, which is the origin of the river Ganga and is named here as Godavari. To reach the top of the hill one needs to go through some 700 steps and usually needs 4-5 hours to cover. It was already dawn and the idea to climb 700 steps didn't clicked me so headed back to Nasik. Reached CBS in 45 min and took a lodge just across the bus stand at Hotel Padma. Hotel is very decent with a bar on top floor and restaurant in the ground floor. Good for family stay and cost'd me Rs 350 double bed without AC. Panchavati (main attraction of Nasik city) is just 15 min auto drive from CBS. please post ur all travel experiences...i like to read..
hope it will help many ppl planing to visit trimbakeshawar..
info are "must know" b4 u reach there..